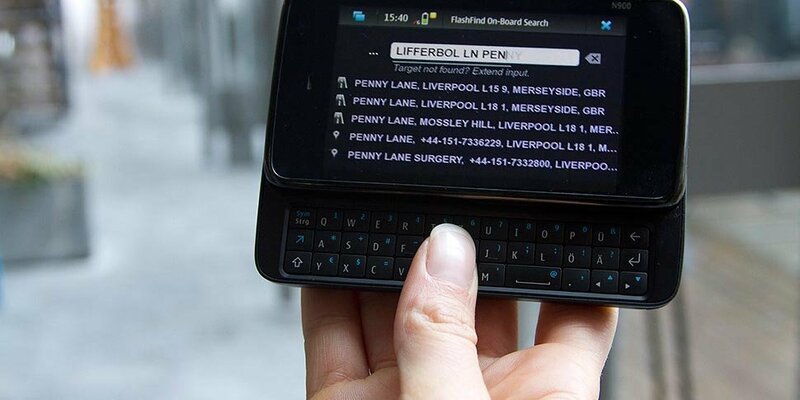 The search method already patented in Europe in 2012 enables instant search in large amounts of spatial data – locally on mobile devices as well as networked in the cloud. Instant search lets results appear after each key press – a separate “search button” is not needed, and often entering a prefix (i.e. the beginning of a search term) is sufficient. Providing phonetic search, the system tolerates a wide spectrum of typing errors. Nonetheless, even for short queries the intended destinations are retrieved effectively. Auto-complete: FlashFind suggests meaningful words after entering just a few letters of a search term. Flexible order of entry: The user can for example first enter a street name and then the city, or the other way round. Intelligent heuristics ensure that results with highest estimated relevance are determined immediately and appear at the top of the result list. Special search functions established in the navigation sector are supported, too, e.g. hierarchical choice of destination, or search along a computed route. With FlashFind, Fraunhofer FOKUS offers companies from different industries such as navigation/ infotainment, geo-information, spatial databases and cloud-based services a highly efficient core search technology. For bringing this innovation to the world-wide market, Fraunhofer collaborates with Iceberg Innovation Capital Ltd.